Which LEO Satellite Did India's A-SAT Missile Shoot Down During Mission Shakti And Where? New Delhi, March 27: Prime Minister Narendra Modi addressed the nation on Wednesday at 12:10 PM announcing that India has entered an elite space club by successfully testing A-SAT, an anti-satellite missile. India is now an entrant in a club of three nations -- United States, Russia and China -- with anti-satellite weapon capabilities, informed Prime Minister Modi. Government sources revealed to ANI that the A-SAT weapon was launched around 11:16 AM on Wednesday and targeted an Indian satellite which had been decommissioned and was orbiting on a 'Low Earth Orbit' at a height of 300 KM from the earth's surface. The entire test, with confirmation of target elimination, took 3 minutes. India Becomes Elite Space Power With Successful 'Mission Shakti' Test, Indian A-SAT Missile Shoots Down Low Earth Orbit Live Satellite in Space. The project announced by Prime Minister Modi in a televised address as "Mission Shakti" was coordinated by Defence Research and Development Organisation (DRDO) Chairman G. Satheesh Reddy and National Security Advisor Ajit Doval along with officers of the National Security Council. 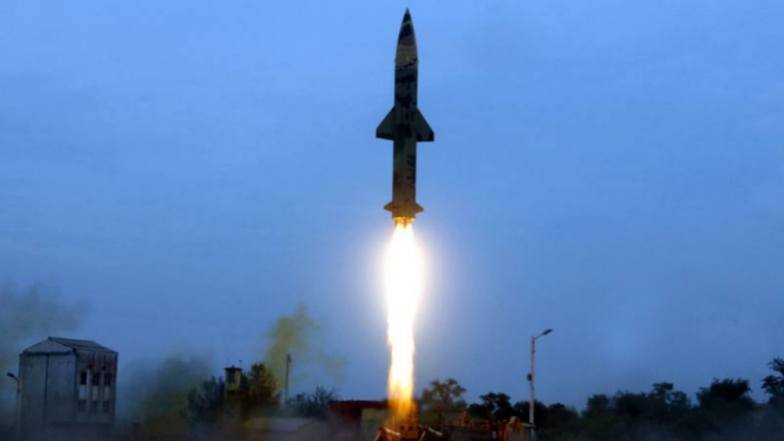 The missile was launched from the DRDO's testing range in Odisha's Balasore. At the time of testing of the A-SAT missile, G. Satheesh Reddy was camping in Balasore to see the project through. "A-SAT missile will give new strength to India's space programme. I assure the international community that our capability won't be used against anyone but is purely India's defence initiative for its security," assured Prime Minister Modi in his televised address. Government sources also assured that this test would have no bearing on India's status in the MTCR (Missile Technology Control Regime) or other such treaties. Speculation was rife on TV channels and social media after Prime Minister Modi had tweeted about his imminent address to the nation after the meeting of the Cabinet Committee on Security (CCS) had concluded. PM was supposed to address the nation between 11:45AM-12PM, however, the televised address was delayed as final confirmations of a successful test were being made. Prime Minister Modi went on air at approximately 12:10 PM and informed the nation of the DRDO's historic test." 'Mission Shakti' is an important step towards securing India's safety, economic growth and technological advancement," said Prime Minister Modi.